A rain garden is a shallow depression containing native plants that captures rainwater coming from roofs, driveways, streets, and lawns before reaching the storm water system. The rainwater slowly infiltrates into the ground because of the deep-rooted native plants. Think of it this way: A rain garden is just a three to six inch depressed perennial bed rather than the typical raised bed. And rather than populating it with plants that prefer dry conditions, our rain garden design is populated with floodplain native species that can tolerate both periods of inundation, during wet times, and drought. As a result, pollutants and peak volumes of water are kept out of natural waterways because it is filtered as it moves through the soil. In addition, by using native plants, rain gardens create habitat for pollinators, butterflies, and other beneficial wildlife. 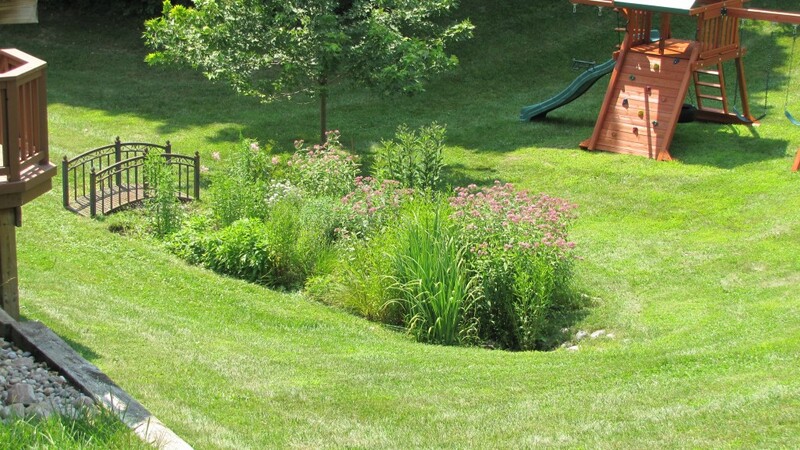 Click here to contact us today if you’re interested in a sustainable rain garden. In urban and suburban environments storm water flows off roofs, streets, lawns, and driveways into the storm water system – typically storm sewers and roadside swales – and is ultimately deposited into streams, rivers, and lakes. Contained in this storm water are all the pollutants and particulates that have accumulated on these impervious surfaces – oil, grease, fertilizers, pesticides, herbicides, and other particulates which are harmful to aquatic wildlife and human health. Learn more about native plants here. We have designed, built, or maintained about 50 rain gardens. Let us know if you’re interested in talking about a rain garden construction project on your property. 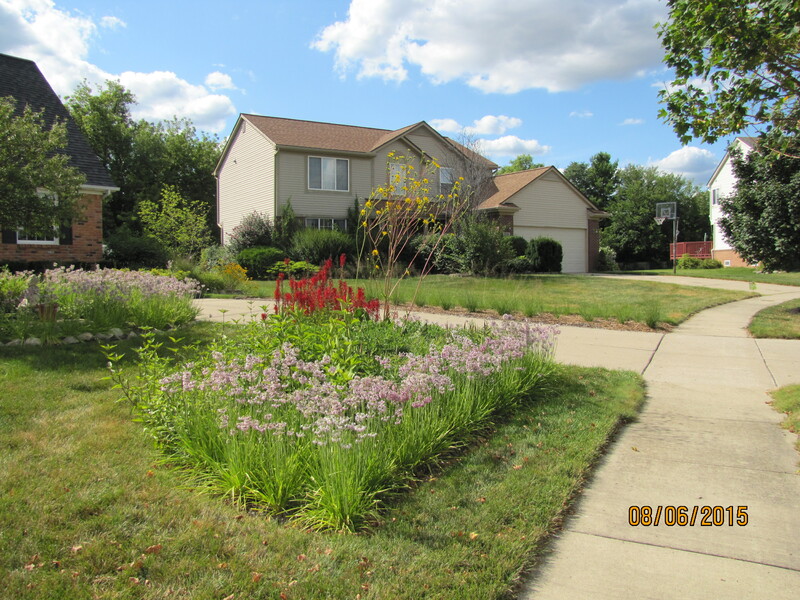 See more pictures of rain gardens we have built here.